Philip II as Augustus, AD 246 to 249. 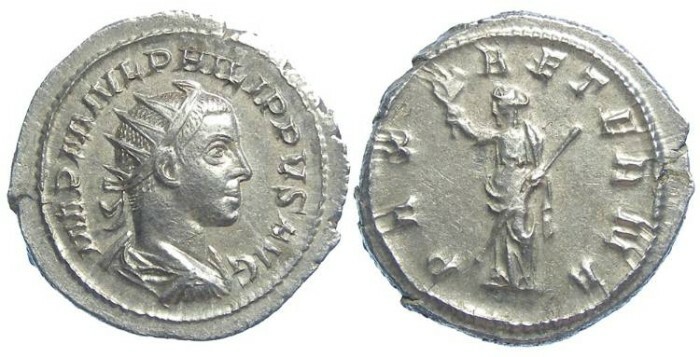 Silver antoninianus. EXCEPTIONAL CENTERING ON A MEDALLIC FLAN. Philip II was the son of Philip I. Size : 22.6 x 23.9 mm. Weight : 4.00 grams. Grade : XF with very good centre and strike, including a full rings of beads on both sides (the beads touch the edge, but no where are they off the flan). Obverse : Radiate head of Philip II right, with IMP M IVL PHILIPPVS AVG around. Reverse: Pax standing left, holding a spear and branch, with PAX AETERNA around.